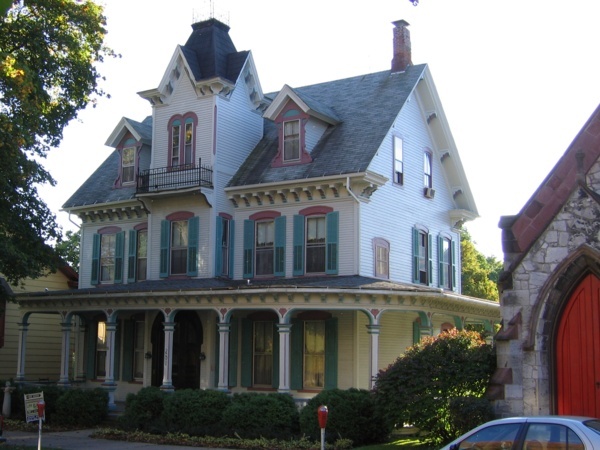 The Hamilton Home is located at 251 N Allegheny Street, across the street from the Hastings Mansion and immediately south of the Episcopal Church (red door). Mr. Hamilton once owned the land where Denver, Colorado is now located. He sold it in exchange for a mule which he needed for his prospecting ventures. Of the eight prospectors who, in 1858, first settled where Denver now is, four were from Bellefonte -- Mr. Hamilton, John Rothrock, James Turner, and Sam Decker. In California, for $600, Mr. Hamilton was offered the land where the city of San Bernardino is now located, but rejected it. ACTUALLY THE DR. DARTT HOUSE -- WEBPAGE CHANGED. HAMILTON HOME IS TWO DOORS DOWN. The house was built in Queen Anne style.